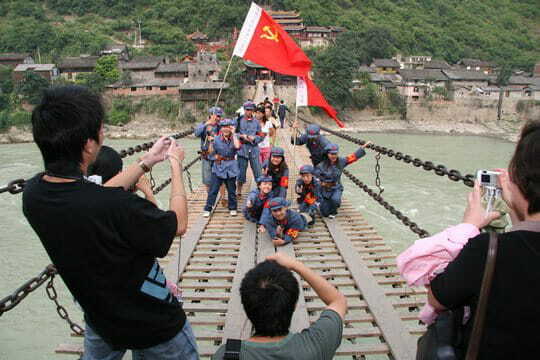 And I am sure most of today’s visitors to this chain link bridge, which is said to have originally been built in 1706, will certainly have the heroic story of the Red Army’s exploits in mind as they stand and pose to have their photographs taken on its gently swaying span – with the tumultuous noise of the Dadu River still roaring unceasing and timeless beneath it. Yet, when I visited the bridge in 2010 and posed for my own picture, I had a very different historical episode in mind. A far less well known stand off which happened almost exactly twenty years before the ‘Long March’ reached Luding. In 1915, during the constantly shifting turmoil of the Warlord era, Kangding 康定, or Tachienlu as it was then better known (དར་རྩེ་མདོ། Dartsendo, in Tibetan), was endangered by rebel Chinese soldiers. Discontent at harsh conditions and a lack of pay had driven this group of soldiers to mutiny, and, having killed their Commanding Officer, they were now a band of outlaws marauding the countryside, robbing and looting as they went. Eventually they arrived at Tachienlu and laid siege to the unfortunate town. 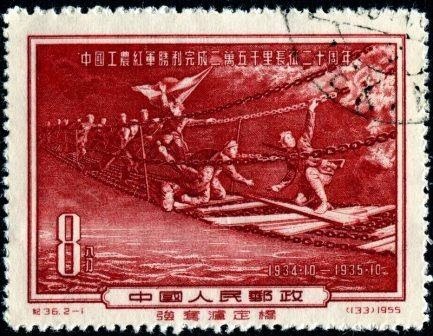 At the request of General Ch’en Hsia-ling, who was then the appointed Chinese Border Commissioner of the region, Louis King, along with two missionaries, Theo Sørensen and Père Francis Goré, and five delegates of the local Chamber of Commerce, set out as a peacemaking deputation. They were met by the mutinous soldiers and in a heated interview with the rebel leader, Ch’en Pu-san and his men, they established that the rebels would surrender under terms of an unconditional pardon, re-instatement, and the full payment of arrears of pay. The peacemaking delegation thus returned to the town only to be fired upon by the understandably skittish soldiers who were very vigilantly on guard at its gates. Fortunately no one was hurt. The Commissioner was surprisingly amenable to the rebel’s terms, but, he said, the final decision was ultimately beyond his local power. The matter would have to be referred to a higher authority in Chengdu. Louis King and the two missionaries set out the following morning to meet the rebels once more. Hearing of the Commissioner’s positive response Ch’en Pu-san decided to act immediately and told the peace delegation that he intended to enter the town with his men. Louis cautioned the rebel leader that this would be taken as an act of open hostility and warned that they would be fired upon by the Commissioner’s soldiers as soon as they were in sight of the town. Not – if they were in the company of the British Consul, Ch’en replied! And so, Louis and the two missionaries were taken hostage by the rebels. A fierce battle duly ensued and eventually under the cover of nightfall the Commissioner and his soldiers withdrew from the town. Tachienlu fell to the rebels, who commenced upon looting the town. Seeing that the rebels were moving further away from their real aim of a pardon, King attempted to reason with Ch’en Pu-san. 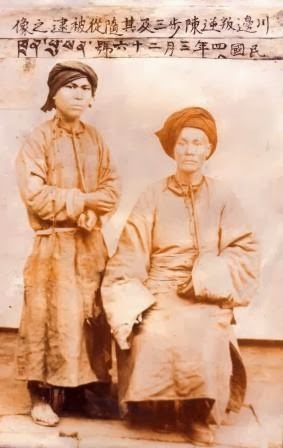 He proposed that if Ch’en were to maintain order in the town so that it could be handed back to the Chinese authorities intact it would go some way towards vindicating them, demonstrating their repentance and good intentions towards their re-instatement. Ch’en apparently saw the sense in this suggestion and immediately ordered his men to cease looting. He then released Louis and asked him to go to the Commissioner once more to renew the rebels’ petition for pardon and re-instatement. 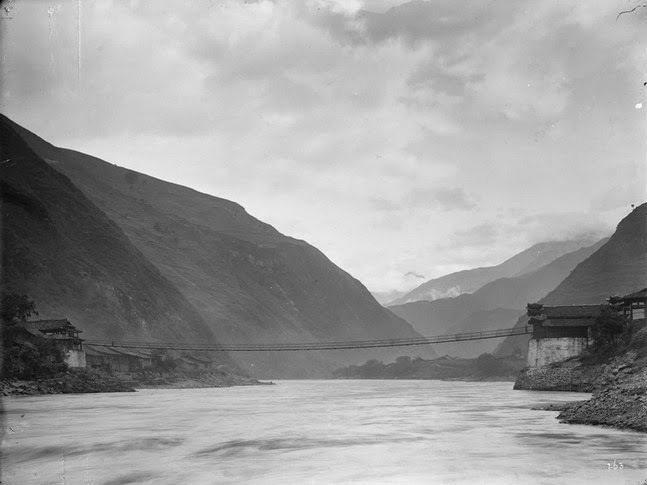 King rode out of Tachienlu and caught up with the Commissioner at the town of Luding, where he found the General and his soldiers consolidating their position. Reinforcements having just arrived from Chengdu. 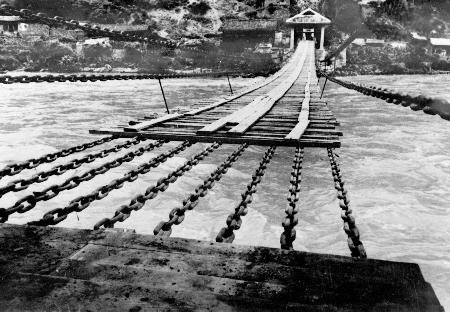 A recent BBC Radio documentary on 'The Battle of Luding Bridge' can be heard here. A very early photo of Luding Qiao (c.1886-1904) by Auguste François (1857-1935) can be seen here.